Today's lesson: Channelling resonance through a vibrationally conductive chamber! As regular visitors to Noise Jockey have read before, I’m pro-drone, and I vote. Any rich, enveloping tone is like audio heroin to me. Why? It’s definitely psychoacoustic, possibly all alignin’ my chakras ‘n’ such, maybe it’s the resonant frequency of my skull…I have no idea. While they’re easy to synthesize, they’re harder to record in the real world, but can be much richer and full of sonic surprises. But it’s not like they’re rare. Quite the contrary: Almost anything will resonate under the right circumstances, but thin metals seems to be the best, including commonplace wire shelving units. In trying to record a set of metal wire shelves in my shed, I started with contact mics, figuring there’d be subtleties to be captured…but putting mics on the thin rods of the shelves prevented them from moving as freely, and it just lacked the character that my ears heard. 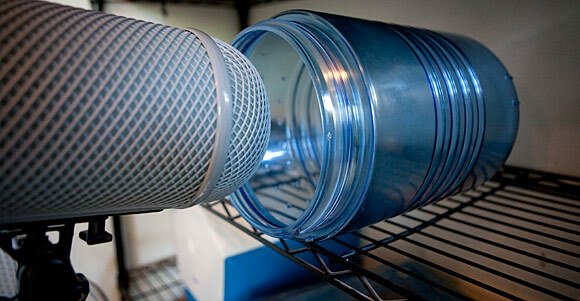 I ditched the contact mics and moved a large, polycarbonate bear-proof food canister onto a shelf and stuck a hypercardioid mic right at the mouth of the canister. This amplified the sound, added more of overtones, and increased the sound’s sustain. Today’s sound is an edit of decays and tones from striking these metal shelves with a hammer. I simply edited out all of the transients of the actual hammer falls, and layered many sequences of these resonant tones together, “boomerang-reversing” some of them to get more consistent volume and tone. However, no plugins have been used. Have you got GRM Freeze? Aside from just looping in a sampler, that could be a fun way of turning the decay into a continuous tone without all the editing, reversing, etc. Yo Michael: Yeah, I do have GRM Freeze. I guess that I got sucked into the Zen of editing there. I like having a little more organic variation than Freeze sometimes offers, but that could be a lack of experience on my part, as well. Your suggestion makes me want to revisit GRM Freeze, though, and I thank you for that!